Thank you to Wendy Lobatto, Service Manager of First Step Haringey for this case study exploring how they are using the THRIVE framework (Wolpert et al., 2016) to support looked after children and young people. What is the First Step service? First Step is a fast track psychological health screening and assessment service for Haringey’s looked after children and young people. The team consists of three experienced clinicians who are notified by the local authority of all new children and young people who enter the care system. After they are notified that a child or young person has entered care, First Step contacts the foster carer to complete a Strengths and Difficulties Questionnaire (SDQ), a measure that assesses the psychological needs of the child, which is then completed on an annual basis to monitor any changes over time. First Step use this tool to screen children and young people’s mental health and emotional wellbeing and help identify looked after children (LAC) with emotional health and wellbeing needs. The government requires all local authorities to report on SDQ scores for their looked after population every year. 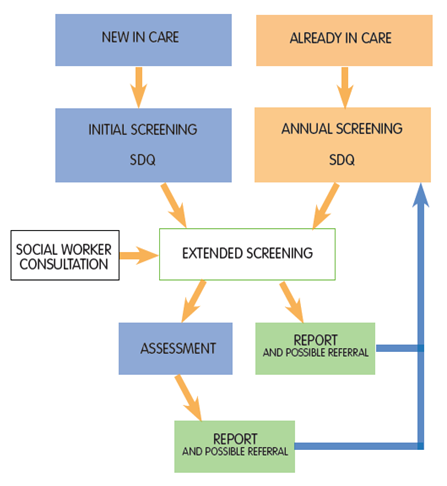 Where an elevated psychological need has been identified in a LAC new into care, a reflective consultation is then set up between a member of the First Step team and the individual’s social worker. They discuss the child’s experiences and their emotional needs at that point in time and determine whether a referral to other services, including child and adolescent mental health services (CAMHS), is indicated. Up to six further face-to-face sessions are offered to the child and their Key Adult Network which consists of professionals involved in the child’s daily life, for example: the social worker, a teacher, carer and sometimes the birth parent. These ‘open-dialogue’ sessions are intended to create a rich picture of the child’s experiences and emotional needs. The outcome is the creation of a tailored, multi-agency plan of approach for the child that ensures more emotionally sensitive involvement to meet their needs. The six sessions offered by First Step to those new in to care vary depending on the need of the LAC. Sessions can include continuing the Key Adult Network meetings, direct work with the LAC and carers, including video-feedback interventions such as Video Interaction Guidance (VIG) and Video Interaction to Promote Positive Parenting (VIPP), and school observations. First Step sees schools as an essential partner agency when trying to meet the emotional needs of children and young people. Schools are always invited to the network meetings which are sometimes convened in schools in order to facilitate school attendance. First Step is currently trialling joint consultations to social workers with their colleagues from the Virtual Education team in Haringey who are always approached when there is an education or school issue. With younger children observations in the classroom can inform the assessment of their needs, as can observations of pre-school children in a nursery or other pre-school setting. Wendy identified that education attainment is one of the markers of good outcomes for children in care. For children with identified emotional health and wellbeing needs already in care, First Step offers a social work consultation and a Key Adult Network meeting to collaboratively develop a multi-agency integrated care plan with shared responsibility and accountability. This is the end of their contact until the SDQ is collected the following year. The report created from this process is uploaded to Mosaic, an online system used by the Independent Reviewing Officer and highlights the emotional health and wellbeing needs of the child to the local authority and social services. What is the First Step Plus service? First Step Plus is a pilot service offering a service comparable with “tier three CAMHS”. Assertive out-reach is provided to children and young people who have had three or more placements over the last year and are unable to access CAMHS, perhaps due to the lack of a safe placement or due to the child or young person’s reluctance to engage. These children tend to be older so they are involved in their Key Adult Network Meeting which allows them to become a part of their network. Wendy notes “Anecdotally, people really appreciate the network meetings”. It is felt that these meetings help to break down the often difficult relationships between the child and the system. First Step is able to access the local authority case record system and this information can be used to inform their assessments. In turn, they upload reports about the child’s needs to this system allowing for transparency and information sharing between agencies. “As First Step is a Tavistock and Portman NHS Foundation Trust service we were aware of the THRIVE framework.” The framework provided them with a helpful way of describing their integrated service to LAC. As they are already focused on the holistic needs of the child, and integrate working with other agencies, they mapped their work onto the THRIVE framework. The work that First Step carry out contributes to several principles of the THRIVE Framework and has a key focus on multi-agency working. Although Wendy recognised that the limited resource means they cannot offer more intensive support, the First Step team have identified areas for potential development. “We would love to do additional work with LAC with unstable care placements… and develop a service to meet the needs of the child to stabilise placements.” This work would help reduce the number of children moving between placements and needing First Step Plus services. When thinking about the ‘Getting Risk Support’ needs based grouping, Wendy recognised that all LAC have some level of risk as a result of being in care. However, First Step Plus offers an innovative service for the most vulnerable LAC who are not accessing or engaging with traditional CAMHS. First Step is working to implement a new service model in September 2017. A series of team days have been organised to support the implementation of a new service model, with the aim of engaging all staff in co-creating the service redesign. Regular consultation with social workers and foster carers will also inform the redesign. Due to the THRIVE-like work already taking place within First Step, there are no foreseen changes to the team processes. Their aim for the service re-design is to become more efficient at meeting the needs of LAC in Haringey.